Tie rod assemblies are used in various applications such as cross bracing, canopies, pipe hangers, and seismic upgrades. Tie rods are an efficient way to add strength or even a decorative touch to any project, while allowing for several inch length adjustments and tensioning. These assemblies are attached to structural steel or fabricated lugs. Assemblies with turnbuckles are limitless in length and provide more overall adjustments depending on the size of the take up of the turnbuckle. Turnbuckles are mostly provided centered on the assembly but can be shifted either way depending on the application requirements such as cross bracing. Sleeve nuts are used in assemblies that often require high strength rods. They are typically right hand/left hand threaded and act as a turnbuckle. Coupling nuts are often used in tie rod assemblies of extreme length in which multiple coupling nuts can be used. This type of assembly can be used in conjuncture with at least one turnbuckle allowing for adjustment. Tie rods are typically provided in plain, galvanized, and stainless steel. Clevis forgings are available in C1035, SS316 or ASTM A688 Class A and A473 Designation A. High strength heat treated clevises are available upon request. Turnbuckles are available as C1035 and SS316. Sleeve nuts and coupling nuts are available in ASTM nut specifications A563A, A194 2H and A563DH. First you will need to know the configuration and finish of your assembly. Once you know whether it is a simple two clevis, turnbuckle, or sleeve/coupling nut assembly, you will have to determine the diameter, size of the clevis, size of the pin, size of the grip and quantity to meet your application needs. The next step is to determine the span of the assembly or pin to pin length of the connection. With the dimension measured from center of pin to center of pin, you can enter it in the tie rod calculator to determine your rod lengths. 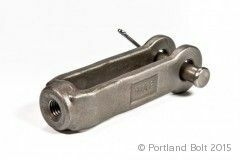 Portland Bolt’s Tie Rod Calculator can estimate the take up of the clevises and turnbuckle (if applicable). If you are using a sleeve nut or turnbuckle with a larger take up than 6 inches, you will need to calculate your rod lengths or you can contact us to help calculate them for you. Steven Wallenstein, Sales Representative at Portland Bolt, is an expert on tie rod assemblies. Contact Steven by phone, through our form, by email, or via chat if you have any questions.